This post has already been read 4540 times! Derek VanLaningham wanted to go big for his graduate studies internship – like working alongside a 7-foot NBA center. 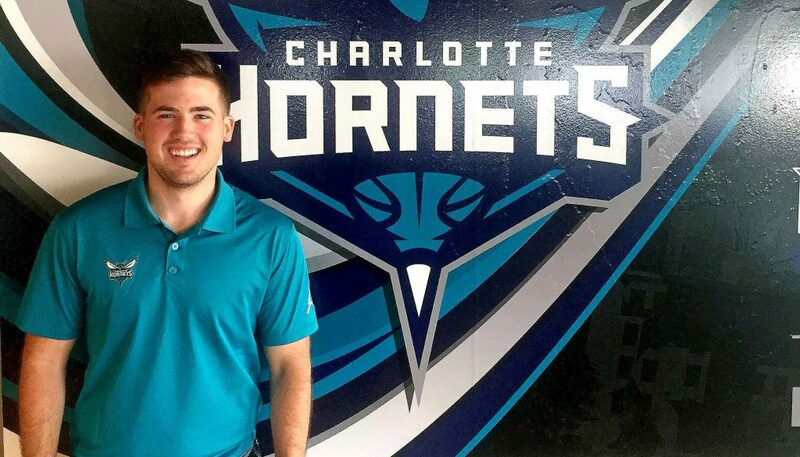 The University of Nebraska at Kearney graduate spent this summer with the Charlotte Hornets Foundation, a position that had him rubbing elbows with Dwight Howard, Kemba Walker, Michael Kidd-Gilchrist and other star players. “It was a great internship,” said VanLaningham, who earned a master’s degree in physical education with a specialization in sports administration in July. The native of Clatonia, population 230 in southeast Nebraska, was looking for “something cool” while scouring the website www.teamworkonline.com, a database of job openings and internships with professional sports teams and events. He chose the Charlotte Hornets gig over an offer from the Fiesta Bowl because he was drawn to its philanthropic mission. VanLaningham worked on several community outreach projects during his summer in North Carolina and met with the team’s general manager, president and head coach. He was in charge of scheduling stops for the organization’s Book Bus, a literacy program for students age 5 to 11. The bus travels to elementary schools in the Charlotte area with mascot Hugo the Hornet, the Spectrum Center emcee and stacks of free books on board. During the team’s day of service, a partnership with Bank of America, VanLaningham found himself “coaching” players as they delivered backpacks filled with school supplies to local children. VanLaningham handled the logistics – buying the supplies, setting up the school visits and making sure Hornet players had their routine down. “You know, you have to look straight up at them because they’re looking down at you,” the 5-foot-10 VanLaningham said with a laugh. His other responsibilities included filling requests for signed jerseys and other memorabilia donated to charitable causes and launching the foundation’s social media accounts. “I actually came up with their first 90-day media plan,” VanLaningham said. The UNK alumnus got to see every aspect of the organization during his internship – event coordinating, public relations, marketing, security – but he never got to meet majority owner Michael Jordan. That was the only disappointment. Although he did give a presentation to Jordan’s brother, James, and other team executives.